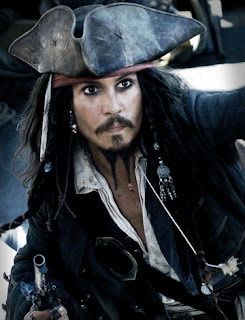 Jack Sparrow is a fictional character and the lead protagonist in the Pirates of the Caribbean film series created by screenwriters Ted Elliott and Terry Rossio, portrayed by Johnny Depp. He is first introduced in the film Pirates of the Caribbean: The Curse of the Black Pearl (2003). He appears in the sequels Dead Man's Chest (2006) and At World's End (2007), and will appear in the upcoming fourth film, On Stranger Tides (2011). Jack Sparrow was conceived by Elliott and Rossio initially as a supporting character, but Jack serves as a main protagonist in the films. He was brought to life by the actor Johnny Depp, who based his characterization on The Rolling Stones guitarist Keith Richards.